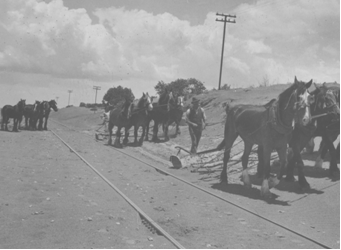 Clearing drift sand from a railway line in the 1940’s. Natural disasters have struck agriculture in a number of ways since colonisation. They can be very local and wreak enormous damage to a few farms in a small area or extend across the whole State. For example a quote from the Bureau of Meteorology website provides incite into the early weather disasters in South Australia. From the very beginning of the colony, the summer heat was a great concern to the new settlers, and heat exhaustion was common. On the inaugural Proclamation Day, on December 28, 1836, the shade temperature had allegedly been over 100°F (40°C) for 4 consecutive days (Corbett, 2002). The hot summer of 1850-51 caused a severe water shortage that badly disrupted the shipment of wheat and copper ore. Also many valuable animals were lost . The drought continued until the end of April when 33 mm (1.5 inches) of rain fell in Adelaide. This was followed by 163mm (6.5 inches) in May and by the beginning of spring, Adelaide had recorded 20 inches since the break of the drought in April. The rain was heavier in the hills and to the south of Adelaide, resulting in flooded creeks and boggy roads. To add to the misery of the weather, unemployment also was running high at the time and many left SA for the Victorian goldfields. Heavy rains in October 1853 caused local flooding in the Barossa Valley and the village of Hoffnengthal had to be abandoned after being settled 6 years before in 1847 by 20 German migrant families. Drought has periodically devastated cereal and livestock industries leading to spin offs to other sectors through resulting shortages of grains for stock feed and down turns in regional economies. At times their severity has been extenuated by overstocking or, as in the early days of the colony, cropping in areas with insufficient average rainfall to sustain an industry over the long term. Failure of the opening rains followed by a below average spring results in dramatically reduced crop yields and pasture growth leading to low yields and shortage of feed for livestock forcing up the price of how and feed grains. northern extremity of cropping land. State and Federal government assistance to farmers has been provided during most major droughts. In the times when transport of stock was difficult and the excessive numbers of stock could not be handled by processing works, governments have provided various subsidies such as for freight and fodder. More recently the assistance has been focussed financial assistance such as interest rate subsidies to ensure the farmer can make his own financial decisions on how to manage his situation. The Rural Assistance Branch has a long history of managing various assistance schemes. Extension advice has also been a key aspect of the Department’s drought role. Livestock feeding and management advice has been provided to help farmers make optimum use of scarce on farm feed reserves and expensive purchased feeds. Fires are a constant risk on farming properties and cause significant losses of fences, sheds, machinery, livestock and homesteads. 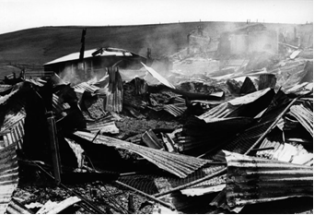 Over the years, there have been a number of disastrous bushfires which have impacted on large areas of the State including 1939, 1951, 1955, 1958, 1959, 1983 and 2005. The Department’s key role is immediately following a fire when teams of staff assess the damage, prepare reports and advise and assist farmers with stock destruction and environmentally sound disposal of carcases. After Ash Wednesday, in February 1983, the role as an essential service was recognised by the State Disaster Organisation and the Department became a member of the organisation. Floods tend to be of a local nature and impact a small number of properties in a severe manner. The 1870 and 1956 River Murray floods were the most disastrous flood events in South Australia. 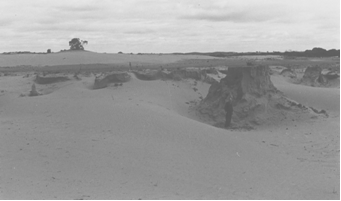 With irrigation settlements scattered all along the River Murray, flooding caused immense agricultural damage. The book “Floods in South Australia” chronicles all recorded floods since 1836 to 2006. Rarely is any mention made of agricultural loss such as crops or livestock even though they have been significant for individuals on numerous occasions. Some floods are of a regional nature. A recent example is the Gawler River flood of 2006 which destroyed over $40m of vegetable crops and property infrastructure on Adelaide Plains. The Department of Agriculture (now PIRSA) played a key role in coordinating response to this disaster while it was occurring, and follow up community relief during the recovery phase. Rural communities periodically experience plagues of various pests and diseases. The most common of these are locusts and mice. The Department of Agriculture has played a key role in managing and delivering state wide control measures for these plagues and providing technical advice to rural communities. Specific pests and diseases of plants and animals have caused disasters for various agricultural industries. These are covered elsewhere on the website under the specific crops they impact upon. Other information about pest animals is detailed on the DENR history websites. From time to time, localised storms wreak havoc in particular districts or on specific industries. A good example is a series of hailstorms that destroyed large areas of glasshouses on the Adelaide Plain in the late 1970’s and early 1980’s. Localised wind storms can also be devastating in particular districts such as occurred when a tornado ripped through a large area of vineyards near Renmark in 2005. Severe unseasonal frosts can also be devastating for grain growers and horticultural industries. Over the last century, the Department of Agriculture has played a key role in coordinating community and Government responses to natural disasters, providing technical advice to farmers on how to deal with particular abnormal circumstances, and supported communities during the recovery phase. From time to time, State and Commonwealth governments have provided financial support to rural communities during recovery from natural disasters. The Department of Agriculture’s Rural Assistance Branch (renamed the Rural Finance & Development Division (RF&D) in 1990) has played a key role in administering these financial relief measures. exceptional circumstances interest rate relief for areas declared to be experiencing hardship as a result of adverse seasonal conditions/industry downturn.